Mobile Teambuilding for youth and adults near MD/DC/VA. 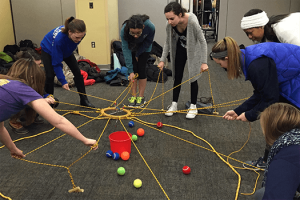 For groups whose aim is a team-building event, on-site or off-site, with specific goals and limited time, the Portable Team Challenge provides a great vehicle for enhancing communication, building trust, and increasing commitment among the members of your group. Our highly skilled and experienced facilitators will divide your group into teams of up to 12 participants, and lead them through a sequence of team challenges that focus on your key goals requirements. Your facilitator will front-load each problem-solving initiative or trust exercise with a metaphor to keep in mind during the activity. This directed activity often leads to key insights about the dynamics of the team. Between exercises, the facilitator will lead a discussion that relates the lessons of the activity back to “the real world” of your school or office environment. This “debrief” helps to transfer the lessons learned through the experience. The facilitated discussions create the environment and opportunity to delve into the dynamics of the team, enabling a fun, recreational event to become a vehicle for improved communication, higher levels of trust, and increased teamwork potential. Sample Team Building Sequence – dependent on goals of the group. The Portable Team Challenge is designed for groups who require more than simply a day of fun out of the school or office. The activities are inherently fun, but what makes them more than just games is the level of facilitation. The Portable Team Challenge is designed to bring the team building benefits of a traditional Low ROPES-style of program to you – at your facility or an off-site location. The program can be used as a stand-alone event, or as part of a larger team development initiative. We can design a program that is specific to your short-term goals, budget, and overall team development strategy.